High quality, durable ceramic pieces like the Legendary dishware used for years by the USDA Forest Service in lookout towers, ranger stations and guard stations. 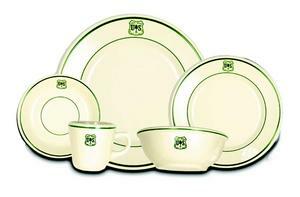 Includes one of each: cup, saucer, dinner plate, salad plate, and soup bowl with the old Forest Service logo. Made in the USA.